Make Your Backyard Beautiful Again! Are you tired of looking into your backyard only to see a boring and out of place pool decking that you had nothing to do with? Maybe you have looked into renovating your backyard and the price was just way too high because they wanted to tear out your existing concrete and replace it. Well, we want to let you know that the process of replacing concrete is completely unnecessary and can be dangerous when it is done around the pool. We have a solution for the drab pool decking you have in your backyard and that solution is our pool deck resurfacing and pool deck repair services! 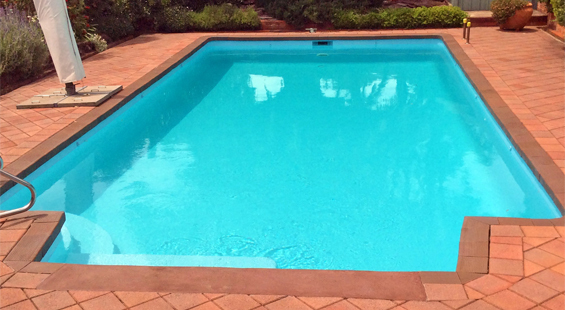 Our team of pool deck resurfacing contractors and installers have decades of experience rejuvenating backyards with a wide variety of materials. 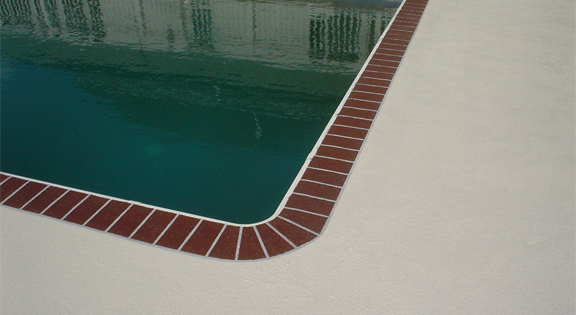 If you want to learn about how we can save your pool deck, please continue reading! When Is It Time To Resurface? 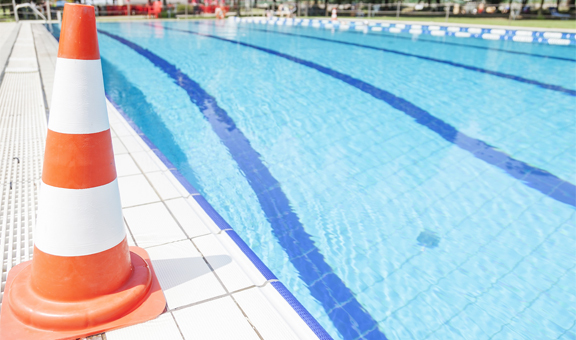 There is a common question that we receive from most of our clients and they always ask if they are still eligible for either pool deck resurfacing or pool deck repair. We will always work and plan work with your best interests in mind so we will always shoot you straight. We will always refuse to work on concrete that has structural damage, unfortunately, there is no way to repair concrete with structural damage like huge cracks, sections that have chipped off or sinking or settling of the concrete slab. We can, however, repair minor cracks, gouges and help you deal with your old and ugly pool decking! Make sure you give us a call ASAP if you begin to notice any type of damage to your concrete pool deck, it is time sensitive! Call us today to see what we can do for you with a free no obligation quote! When you choose to use our pool deck resurfacing surfaces to revitalize your pool deck, there are some benefits that you stand to gain. From superior heat resistance to having pride designing your own pool deck, we have you covered. 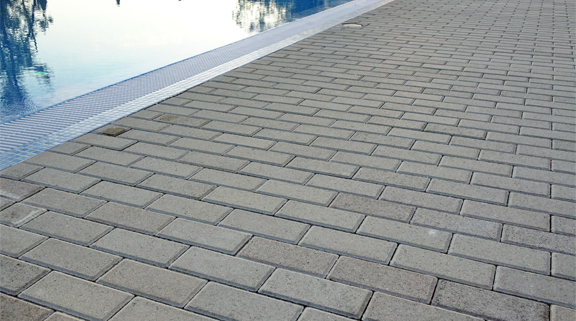 Pavers are a unique option for the concrete pool deck resurfacing process as they can be installed right over your existing concrete slab. Pavers are a perfect material for pool decking as they will never stain from the harsh chemicals in the pool, can be washed down with the hose for easy cleaning and can be replaced with ease if necessary. Pavers can provide a more elegant appearance opposed to a spray on decking or a kool decking as they can be used to create intricate patterns on the concrete pool deck in Austin. Stenciled concrete is for the person that wants to save a couple of bucks by not using a stamped concrete overlay but think that acid stained concrete pool decks are too boring. A stenciled concrete pool deck is an acid stained concrete that requires the use of stencils to help mimic stones, wood, and even pavers. The acid stain helps create a veil of illusion that makes the concrete actually look like the natural material that it is trying to recreate. 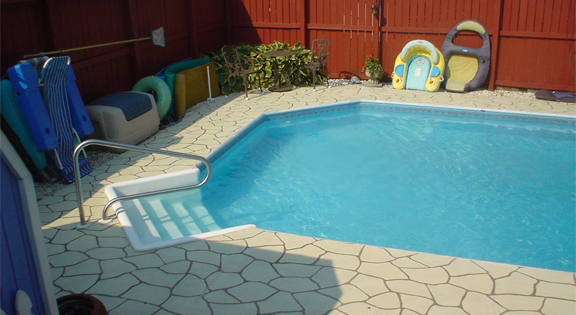 Spray decking is one of the most common and consistent concrete pool deck materials for a good reason. For decades spray on decking has been the go-to for its superior heat deflection and its natural grip even when it is wet that it receives from its texture. Spray on decking is perfect for pool deck resurfacing in Austin as it can be done very quickly and the benefits can be used almost instantly. We think spray on decking has the advantage of kool decking as kool decking can only be applied to new concrete which is not ideal for pool deck resurfacing. Acid stained concrete is one of the most affordable methods of altering the concrete slab during the process of pool deck resurfacing. This is because the only preparation that needs to be done to the concrete is a repair of all minor cracks and gouges and a follow up by a chemical sprayer. There is a huge selection of colors that stain is available in so there is no shortage of customization. Another benefit of acid stained concrete is that the top coat can contain an additive that resembles salt, giving the concrete pool deck more traction when wet. 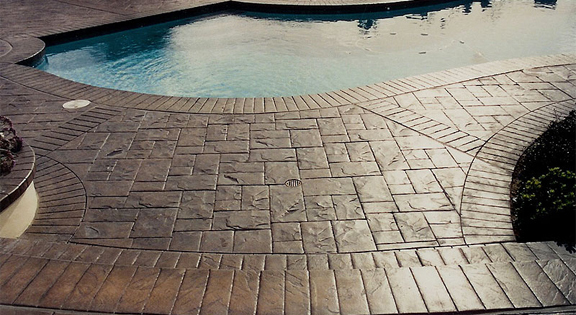 Stamped concrete is one of the coolest and most unique concrete pool deck applications that you can find on the market today. When you choose a stamped concrete as the preferred method of pool deck resurfacing, you will enjoy a pool decking that can make your pool decking appear to be natural stone, real wood, and even tile if you wanted to. Stamped concrete is also able to receive the same top coat as acid stained concrete. Acid stain can also be used on stamped concrete overlays to provide even more lifelike coloring effects! Do you like the current decking that you have applied to your concrete pool decking? We have an option for spray on or kool decking that only requires a small repair to be done to save money. We can paint the pool deck as a form of pool deck repair that can transform the appearance of the back yard in a way that you won’t believe came from small repairs and simple paint job. There is a wide variety of acrylic pool deck paint colors to choose from as well so you won’t feel limited in options. Make sure you give us a call today for a free no obligation quote! Masters of Consistency & Quality. Creating a sustainable future through building preservation, green architecture, & smart design.